Laser Dentistry – Is It Really Pain-Free? Dental care is a necessity for everyone. A good smile and regular visits to the dentist are both absolutely crucial for our overall health and wellness. However, the idea of going to the dentist conjures up fearful images of pain and discomfort for many people. We’re here to tell you that it shouldn’t! There is a new way of performing dental procedures that is fast, effective, and smart. Laser dentistry in Stamford, CT, has numerous benefits that can change the way you think of going to the dentist. Perhaps the most important thing to mention about laser dentistry is that it is virtually pain-free! Below, we will tell you more about this amazing new technology and why it is pain-free. If you are having issues with gum recession in Fairfield County, CT, or would like to try out laser dentistry in Stamford, CT, schedule an appointment with Periodontics & Implant Dentistry Center, LLC today! Laser dental treatment works by using a focused beam of light energy to perform extremely precise dental procedures. The laser is easy for dental professionals to control and can be used for a variety of different treatments. Dentists can use lasers to cut away tissue, help with tooth decay, and fix any soft tissue issues in gums. There isn’t a lot of blood loss with laser dentistry in Stamford, CT, thanks to the cauterization that occurs as the light beam is applied to the tissue. Dental lasers can also help to prevent bacterial infections in the mouth because they sterilize as well. You might think that having a high-powered dental laser pointed directly at your teeth and gums is a painful endeavor, but this is actually not the case. Dental lasers are virtually pain-free for a few reasons. It’s less invasive than traditional dental procedures. For example, laser dentistry can be used instead of invasive procedures that involve using scalpels and drills. You also won’t need anesthesia as much with laser dentistry. Cavity filling and biopsies are also much less painful, thanks to laser dentistry. The lasers are operated with accuracy, which means you won’t need any stitches after the procedures are completed. 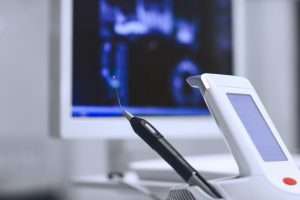 You really can’t go wrong with laser dentistry in Stamford, CT.
We hope that this article has shed some light on this fascinating new dental technology and how it is pain-free for patients. Contact our offices to schedule a consultation!